Tell us what you like and dislike about Coinbase Pro. Help others make more informed decisions based on your insights. It was easy to use. I’m not too computer savvy, so I definitely need easy. I thought it was fine the way it was – I’m still pretty new to it at this point. It's free and definitely the safest option compared to other fiat to crypto exchanges. I wish more tokens were available for purchase with Coinbase, but that is changing soon. GDAX is my favourite because of the low fees and great UI in terms of order book and charts. I don't like the fact it isn't well advertised that GDAX is the trading site of Coinbase. Coinbase is great but the fees are terrible so historically I wasted a lot on fees on Coinbase without realising I could do the same on GDAX for much lower fees. Now GDAX is Coinbase Pro. It is meant for frequent trading, but I don't make frequent trades and instead take advantage of the lower fees vs. Coinbase. Because it is meant for more professional traders, the interface is definitely more complicated and confusing. I like how it gives me a more detailed information about the market and pretty granular controls over automated transactions. Not very intuitive to use, especially with the Coinbase connection. Minimal fees. I also like the aesthetics and feeling like a true trader. A bit complicated to learn at first. Their regular Coinbase UI is more intuitive. Insurance against theft and hacks for my crypto assets and FDIC insurance for my cash. Lack of support for alt coins and tokens and various forks. It has a very clear interface, with easy euro deposits and withdrawals. Easy trading between crypto and fiat without the need for something like tether. There are only 4 cryptocurrencies listed, so for others I still have to use other platforms. o% maker fees and good liquidity. There isn't much to like about any of the exchanges that currently exist. The functionality is garbage. Liquidity is still lacking. Spoof trades are too common. 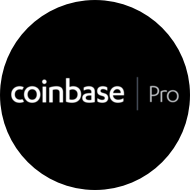 Formerly known as GDAX, Coinbase Pro is an American fiat exchange – allowing its users to exchange US dollars, British pounds and Japanese yen for various cryptocurrencies. Merchants and consumers can transact with new digital currencies like bitcoin, ethereum, and litecoin.